The Yale Indigenous Performing Arts Program (YIPAP) is sending students to Hawai‘i Island in March 2017 to view sites related to the life of Ōpūkaha‘ia. 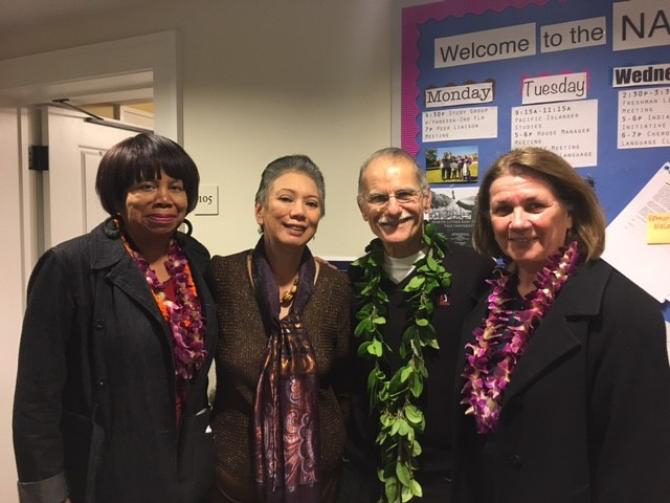 The performing group met in late January with Ōpūkaha‘ia ohana representatives Deborah Lee of Hilo. Deborah led in the returning of Henry’s iwi (remains) in 1993 to Hawai‘i from his 1818 grave site in Cornwall, Connecticut. Deborah traveled to Yale University in New Haven and to Cornwall. At Cornwall, they visited the Steward’s House in Cornwall where Henry once socialized and ate meals. A post at the YIPAP blog hosted by Yale University details the visit to Cornwall in words and photos. 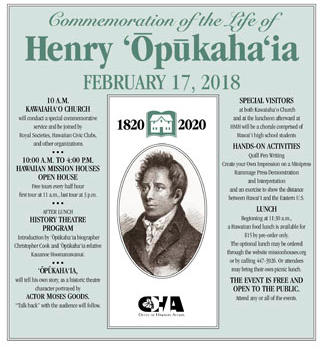 Plans are underway to commemorate the 200th anniversary of the death of Ōpūkaha‘ia-Henry Obookiah in Cornwall, Connecticut on February 17, 1818. • Dave Buehring in mid-February held his second annual Hana Hou History Tour on Hawai‘i Island. Dave is taking reservations for the 2018 version of the tour (February 16-19, 2018), which will be tied into local events tied into the 200th anniversary of Henry’s death. A report from Brown University, reporting on Brown’s team who wrote the National Historic Site description of the house, mentions that Yale professor and author John Demos played an important role in securing the historic designation. Demos is the author of The Heathen School, a detailed book on the Foreign Mission School that includes an account of Ōpūkaha‘ia. Yale University’s Yale Indian Papers Project blog posted a current photo and brief story on the designation of the building as a National Historic Site. • Peter Young of the popular Images of Old Hawai‘i blog is posting informative updates on the upcoming series of bicentennial events tied into Ōpūkaha‘ia and the Sandwich Islands Mission pioneer company. • February 17, 2018 is Ōpūkaha‘ia’s bicentennial of his passing. October 23, 2019, the First Company of Missionaries leave Boston. March 30, 2020, the mission first sights Hawai‘i Island, April 4, 2020, the arrival of the missionaries at the Plymouth Rock of Hawai‘i in Kailua-Kona. The Story of Mokuaikaua Congreational Church is 32-page booklet I helped create over summer 2016. Mokuaikaua Church (www.mokuaikaua.org) is located along the waterfront in Kailua-Kona on central west shore of the Island of Hawai‘i. Here the first missionary party sent to Hawai‘i formally landed in early April 1820. Mokuaikaua is the “first-gathered” church in Hawaiʻi, and the “oldest-stand” church building in Hawaiʻi. Construction funded by Hawaiʻi Island Governor Kuakini (John Adams) in 1836 built the stone-and-mortar walled church that still stands today. The church is pictured in the cover illustration above, you can’t miss the church as it then towered over all the thatched hale and wood-frame western buildings of old Kailua town. 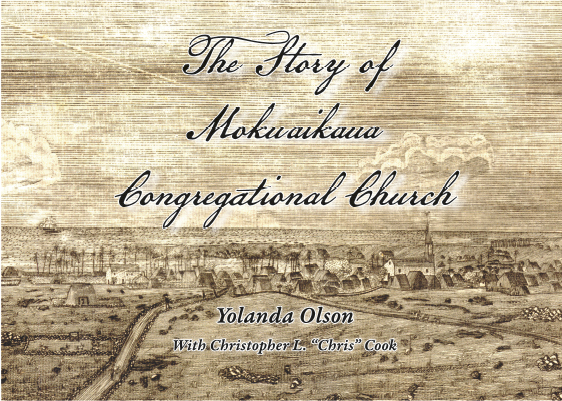 Mokuaikaua Church Historian Yolanda Olson wrote the main text of the booklet. I did the background research, editing, graphic design, photography. I contributed a section I call “A New England Church with a Hawaiian Heart.” This contribution details the dual, hybrid New England-Native Hawaiian architectural features found in the Mokuaikaua Church building. Proceeds from sale of The Story of Mokuaikaua Church are helping to raise funds for a $3 million restoration needed to make the historic church earthquake proof, to replace hardwood ʻōhiʻa beams that date back to the 1820s, and other repairs needed to preserve Mokuaikaua. Go www.mokuaikaua.org for more details. Copies of the booklet are available at the Mokuaikaua Church in Kailua-Kona. Check on their website for contact information.